The World Bank released a report Tuesday on the state of jobs in the South Caucasus region, and it cited work-force concerns about Azerbaijan. The report said the resource-rich country has seen an impressive amount of growth over the past decade, and that the rate at which poverty has fallen within Azerbaijan has been steady, with the poverty-line percentage falling from 15.8 percent to 6 percent from 2007 to 2012. The World Bank report said these gains might plateau or even retreat because of a shrinking work force and an over-dependence on certain sectors. The country has seen increasing inactivity among people who are able to work, but are not seeking jobs. 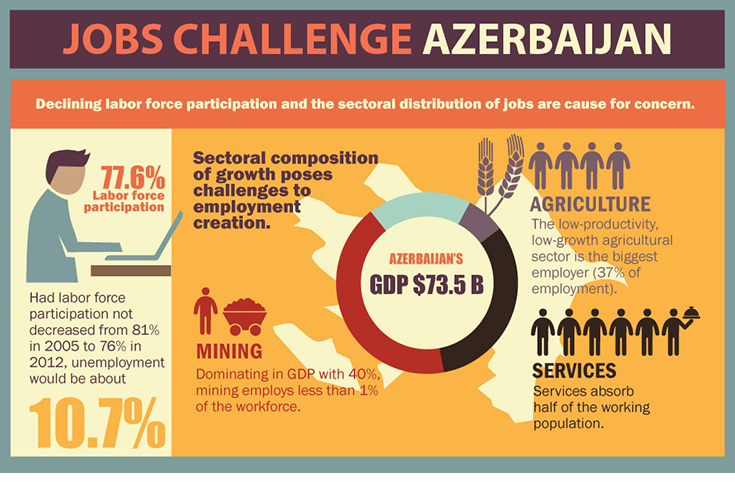 In 2012, Azerbaijan had a labor force participation rate of 78 percent, down from 83 percent in 2005. The unemployment rate would be approximately 11 percent if labor force participation had not declined, as opposed to the reported 5.2 percent. The bank suggests that reforms be implemented that support increased job creation within the private sector. The agriculture sector is currently the largest employer in the country, employing 37 percent of all workers, but it only produces 5 percent of gross domestic product and remains one of the largest obstacles the government faces on the unemployment and work-force participation rate fronts. Want to get notified whenever we write about World Bank - Azerbaijan ? Next time we write about World Bank - Azerbaijan, we'll email you a link to the story. You may edit your settings or unsubscribe at any time.